Sarasota Dentistry » Blog » What are Full Arch Dental Implants? If you need a full arch of teeth replaced, Dr. Hank D. Michael can place full arch dental implants to restore the function and beauty of your smile. During this treatment, he will use our advanced 3-D imaging to determine the most effective positions for your implant posts. Then, using a personalized surgical guide, he will place several implant posts to support a custom-crafted denture. Your restoration will be extremely stable and lifelike. Am I a Candidate for Full Arch Dental Implants? If you are missing most or all of your teeth, full arch implants may be right for you. They can also be a great solution if you have widespread dental damage that requires full mouth extraction. Additionally, you may choose full arch implants if you currently wear a removable denture, and are looking for a more lifelike, durable, and comfortable alternative. Dr. Michael will carefully examine your oral health and study your jawbone in 3-D with a CT before recommending full arch implants. He will look for signs of jawbone degeneration, which can affect the stability of your implants. If needed, he may recommend bone grafting to build a more stable foundation for your restoration. If you are eligible for dental implants treatment, Dr. Michael will guide you through every step of the process to ensure you are informed of your options. Before surgery, Dr. Michael will design a custom treatment plan to ensure the best possible results. First, he will take photos and digital x-rays to create a three-dimensional digital model of your mouth. Using his computer-guided implants system, he will create a personalized surgical template. He will also look for the most suitable positions for implant placement. 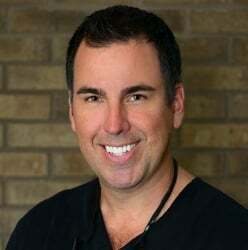 On the day of your procedure, Dr. Michael will administer local anesthesia. In most cases, he will also recommend sedation. Using your surgical guide, he will place four or more implant posts in your jaw. Often, he will place them at a slight angle to minimize the impact to your surrounding bone tissue. Once in position, you will proceed in one of two ways. Either an immediate implant retained full arch dental implant restoration with permanent teeth or you will need to wait four to six months before you can receive your permanent restoration. If you are required to delay the restoration due to healing time requirements, you will continue to wear your removable denture during this time. After the healing process is complete, you will return to our office to receive your implant retained dentures. Implant retained dentures can be permanent or removable – you will need to consult with Dr. Michael to decide which is better for you. If an immediate implant retained denture is fabricated the day of implant placement, it will most likely need to be replaced or repaired after the gums are healed in order to maximize the fit and comfort of your implant retained denture. Dr. Michael can place full arch dental implants on both your upper and lower jaw, making this treatment incredibly versatile. In some cases, it may also be possible to perform immediate implant placement. With this treatment, you can have cracked, broken or decayed teeth removed and leave the office with restored dental function after just one appointment. What are the advantages of Full Arch Dental Implants? Aesthetics: Your restoration will be crafted to match your facial structure, and it will sit directly on your gum line. Therefore, it will be virtually identical to natural teeth. Stability: Because your implants will be permanently affixed to your jawbone, they will never slip out of place. Therefore, you will not have to worry about embarrassing slippage or a restricted diet. Oral health: Dental implants are the only type of restoration that can prevent jawbone atrophy, the loss of jaw bone tissue that occurs in the absence of tooth roots. Durability: With proper care, dental implants could last the rest of your life. Because your jawbone will remain stable, you will not have to receive adjustments to your restoration. At Sarasota Dentistry, we believe all our patients deserve to be proud of their smile. If you are considering full arch dental implants or need other dental treatment, just ask! We’re happy to help.